As net exporting countries become net importers of oil, growth tapers. This is the trend, Egypt and Indonesia are two examples that tipped the scales recently. This is a result of increasing consumption and decreasing production efficiency. Energy returned on invested is crucial to understand. It is costing more energy to extract the same amount of oil. Peak oil is the notion that the world peaked in energy production. Critics of this argument can be heard citing recent oil discoveries, oil shale and natural gas. The problem lies in the cost of excreting the oil. We must spend energy to extract energy. When the sum of all the inputs becomes too great relative to the output, the jig is up. 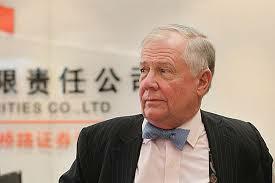 Jim Rogers co-founded the Quantum Group of Funds in 1973. He has warned investors that governments could loot savings and pension plans soon. With gold coming down again over the last month, I asked him about his gold holdings now. “You see, there is going to be chaos out there over the next decade,” he began. “It could be a monetary disaster or even war. This turmoil could come from a gigantic debt problem, for instance, which could cause world economies to fall apart as well. Politicians don’t know what to do besides printing money – so that’s what they end up doing. We will see a wave of turmoil from all this that will surely take gold higher. Could certain countries really go to war over the next 5 years? “Well, wars start with absurd actions by absurd politicians – they always have. I wouldn’t expect there to be a war over the Ukraine, for instance, or over a few rocks in Asia. But wars always seem completely unthinkable until they happen. The leaders of the “free world” are on the run. In many cases, they can’t go out and travel due to the risk of being arrested, protested or even having a shoe thrown at them. In just the past few weeks, First Lady Michelle Obama, Former Secretary of State Condoleeza Rice and Attorney General Eric Holder have had to cancel appearances due to protests. They’re just the latest in a long line.